Iv’e talked about this before asking if people should be required to take a course in gaming etiquette before they are allowed to play online, this would be nice but will never happen. What goes into the process of determining good behaivor? What are the rules to being proper? What is the code of conduct ? Oddly enough when a gamer chooses to play online with their respective system they must first agree to the rules of that specific company, the code of conduct. Somewhere in the tiny text are rules and regulations that if broken you will have severe consquences. Having said that, when you go to play a game do you pay attention to your own behaivor? 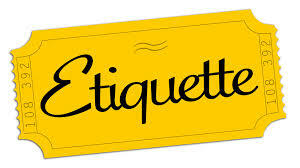 Do you not care about etiquette? Share your thoughts on this. Be sure to like , comment and follow. Previous Previous post: The Big Fat Box- My thoughts on the Xbox One. Next Next post: Jump off the bandwagon.